Ford Inside News Community > Vendors > CARiD.com > Get $100 Back with a purchase of any BedSlide Product at CARiD! Loading or unloading cargo from your Ford is a tough task that can put a lot of strain on your spine and muscles. BedSlide knows that the easiest way to access the gear in your truck bed is to make it slide out to you. They've come up with cargo management solutions that transform your truck bed into a sliding drawer. All BedSlides products are made from composite weather-proof decking material and are tested to meet the warranty requirements and weight specs. Whether you are an outdoorsman, contractor, or weekend DIYer, you are sure to enjoy the ease of access these systems provide. Today we are here with Spring Offer from BedSlide! 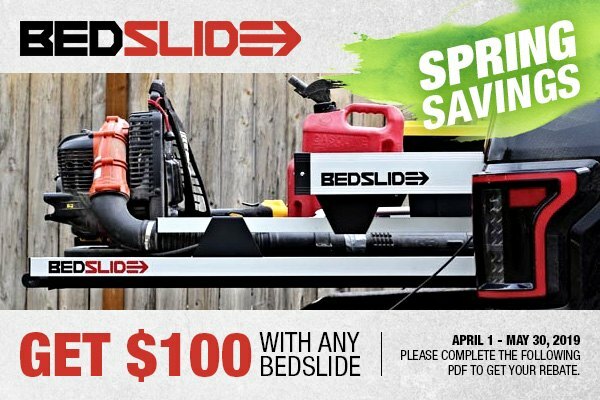 You have a great chance to get $100 back with the purchase of any BEDSLIDE product. Act now, this offer expires on May 30, 2019. Please complete the following PDF to get your money back.